It goes without saying that the growing appetite for housing has prompted many Singaporeans to propose this way. Further, with an average waiting time of three to four years for the completion of a BTO or Build-To-Order flat, balloting for one prior to an actual marriage proposal has long been the norm for couples here. 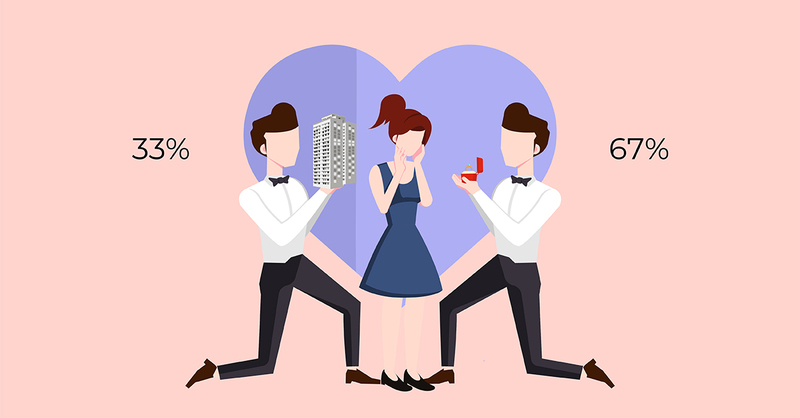 However, the rollout of new initiatives, which include shorter waiting times for certain BTO flats to more booking options for Sale of Balance Flats (SBF) may have changed the way some Singaporeans approach marriage proposals in recent times. Based on our recent poll survey on Facebook, about 67% of our respondents said that couples should apply for a BTO flat only after a proposal, perhaps providing some indication that romance is still the main consideration for couples when contemplating marriage these days. That said, while a romantic marriage proposal might be what every girl (including myself) wants, marriage is a lifelong commitment and getting a home together remains an important milestone for many couples, which makes early and strategic planning imperative. Buying a resale home is an attractive proposition for many since they are now able to pick a location they like and are no longer subject to waiting time or a time constraint. For instance, resale flats located near MRT stations tend to be highly favoured amongst buyers, as many Singaporeans do not drive.